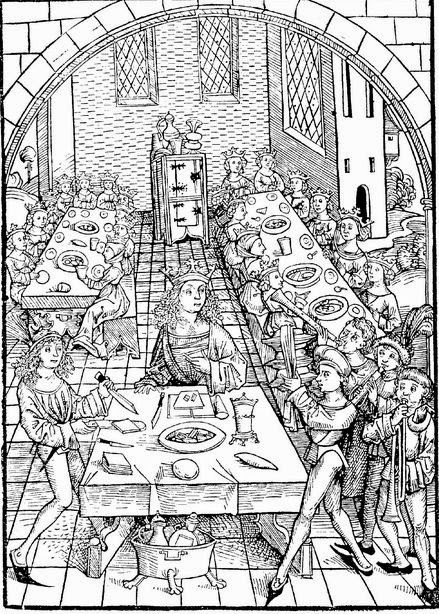 When I first started learning about food and social history in Medieval times I had thought that the terms "feast" and "banquet" were interchangeable. I could not have been more wrong! Below we have Chaucer with 29 comrades feasting at the Tabard Inn in Southwark in Southwark, London before the start of their 60-mile, four day pilgrimage to the shrine of St Thomas a Beckett in Canterbury. They are feasting, but they are certainly not banqueting. They appear to be enjoying a boar's head and a large fowl and several oval loaves of bread. Thy drasty ryming is nat worth a toord!" Below we have another scene - but is it a feast or a banquet? The King is eating at a high table far removed from lesser princes, and is individually served by two servants. He has a particularly regal looking salt cellar! But this too is a feast and not a banquet. 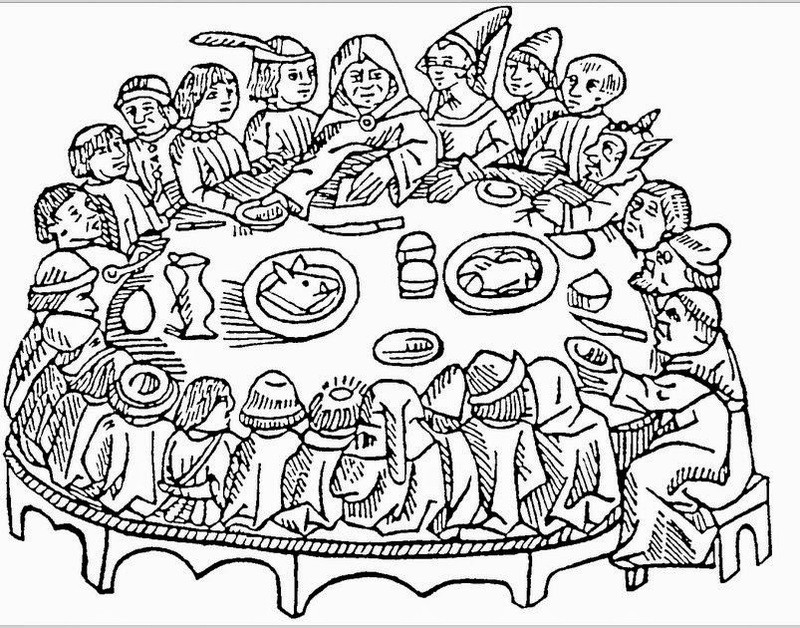 The term feast was used in medieval times whenever people gathered together to eat several courses of food together. But a banquet was the last course of the feast taken in a separate room by only the host and his most important guests. Here, away from the noise and possible squalor associated with the later stages of a feast, the favoured few would retire to drink wines infused with digestive herbs or spices. And perhaps enjoy entertainment provided by musicians. Gradually, with time, the last banquet course came to include sweet dishes too. Such as imported fresh or dried fruits, or coloured marzipans or "marchpanes". And the single banquetting room became a banqueting suite, preferably with a pleasant, elevated view to impress one's special guests. MedievalMorsels has produced a dollshouse miniature entertainment piece - a fancy pastry crust pie. This was designed by the Medieval pastrycook to be presented at a feast not a banquet, thereby impressing all of the gathered guests of his Lord and the mistress of the household.